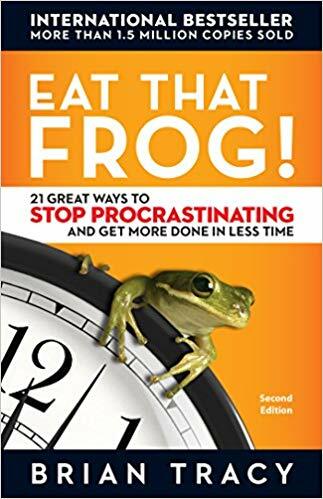 Eat That Frog is a book about overcoming procrastination to achieve success. It operates on the principle that if you have to eat two live frogs (i.e., complete tasks you don’t want to do), it’s best to eat the biggest and nastiest one first. Also, if you have to eat the frog anyway, it’s much better to get it over with quickly. This book is chock-full of advice on developing self-motivational skills, to set and achieve the goals, and success, that you desire. We have compiled this advice into a series of actions and habits you can practice. Remember, sitting around isn’t going to help you accomplish anything, so implement at least one action/habit in your life today, and you will notice amazing results. Brian Tracy is Chairman and CEO of Brian Tracy International, a company specializing in the training and development of individuals and organizations. As a keynote speaker and seminar leader, he addresses more than 250,000 people each year. He speaks to corporate and public audiences on the subjects of personal and professional development, including the executives and staff of many of America's largest corporations. His exciting talks and seminars on leadership, selling, self-esteem, goals, strategy, creativity, and success psychology, bring about immediate changes and long-term results. Prior to founding his company, Brian Tracy International, Tracy was the chief operating officer of a $265 million-dollar development company. He has had successful careers in sales and marketing, investments, real estate development and syndication, importation, distribution, and management consulting. He has conducted high-level consulting assignments with several billion-dollar plus corporations in strategic planning and organizational development.